Mission Accomplished: The Commander & Continuous Process Improvement. The U.S. Department of Defense has dictated the implementation of Lean Six Sigma to achieve the highest level of cost-wise readiness. Indeed, the lifecycle costs of operating and maintaining today’s advanced weapons systems are more expensive than their acquisition. Hence, there is pressure to reduce the costs of operating aging equipment and maintain ever higher levels of readiness. However, unlike a steady production line in manufacturing, demand in military logistics systems is highly variable and uncertain. Lean Six Sigma deals effectively with this fundamental issue of military operations. Applications are adjusted or supplemented with methodologies such as Theory of Constraints to improve maintenance throughput and turnaround times while optimizing inventories and associated supply chains to protect readiness. Lean Six Sigma provides the framework for making fact-based decisions, enabling processes to be positively changed within the military ranks, and driving continuous improvement using a structured approach. In this way, the armed services achieve sustainable readiness increases and cost-control. NOVACES has crafted a roadmap called SystemCPISM that is designed to plan and manage large-scale deployments of continuous process improvement. 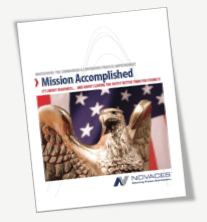 Click here to see a selection of case studies and examples of the results we have acheived for defense organizations. For more information about our consulting and training services for Lean Six Sigma in defense, contact us. Government leaders are looking to industry-proven best practices to improve public systems like education, transportation, social services, waste management, environmental protection, and much more. As a result, governments are beginning to see that implementing Lean Six Sigma can produce the results that taxpayers are demanding. Outside of the business sector, process improvement goals are more focused on improving cycle time and service quality. For example, already poorly defined processes suffer from complexities introduced by defects, poor information flow, and excessive handoffs – all major causes of long cycle times. Lean Six Sigma provides the tools to visualize and document rework routes, information flow, and handoffs. It also provides a powerful roadmap for continuous improvement. Importantly, practitioners must understand how to adjust Lean Six Sigma tools from their roots in manufacturing to service-oriented applications in the public sector. Fortunately, this work has begun. Success stories from cities across the nation such as Fort Wayne, Indiana demonstrate that the methodology can produce impressive results. Click here to see a selection of case studies and examples of the results we have achieved for government organizations. For more information on Lean Six Sigma implementations in Government, contact us.